I am in playing baseball as I've written. I play baseball early inthe morning on Sunday and come back to home before noon. I got two dead-balls a game. It were made ball decisions because I didn't escape. That's how. Today, I'm going to write why I don't eacape from inside-balls. yes, the ball made from rubber is usually used on a sandlot baseball. It is just rubber. If you get dead-ball, you wouldn't be had bones broken. So, we don't have to escape. Second. You can't hit if you are in fear. You can't have hits if you escape from slow balls by a poor pitcher !! 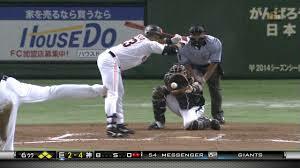 If the pitcher throw inside-balls close to you, you should threaten him !! Anyway, I think it is important to have hits that you have feelings against pitchers. Third. The ball would be curved. This reason is the most important. Slider-type balls go from inside to middle of strike zone. These are the easiest ball. If you escape from inside-ball, you can't hit them. You should watch the balls' route. If you want to have hits, It is very important !! This is the reason why I'm called "slider-hitter".